Negotiator (formerly King Of Shaves) are a UK based team making who made their debut in 2004. The team is the first British entrant since 2000. The team is owned by Chris Parsonage who's promotional company is responsible for bringing the British Grand Prix to Plymouth. In 2005 Randy Scism joined the team. Randy was the 1999 World Champion and brought a wealth of experience to the team. 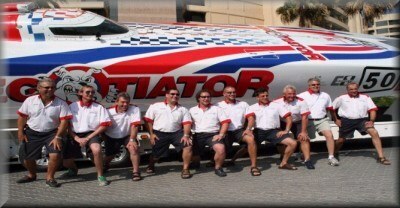 2006 saw the team gain a major new sponsor in King of Shaves and a change in boat name also occured. The team shot to fame for all the wrong reasons in 2006 when the boat flipped during the British GP. Both James Sheppard and Chris Parsonage emerged unhurt and generated a media frenzy with Class 1 getting in the news on all major UK TV channels.